A simple worksheet for discussion. 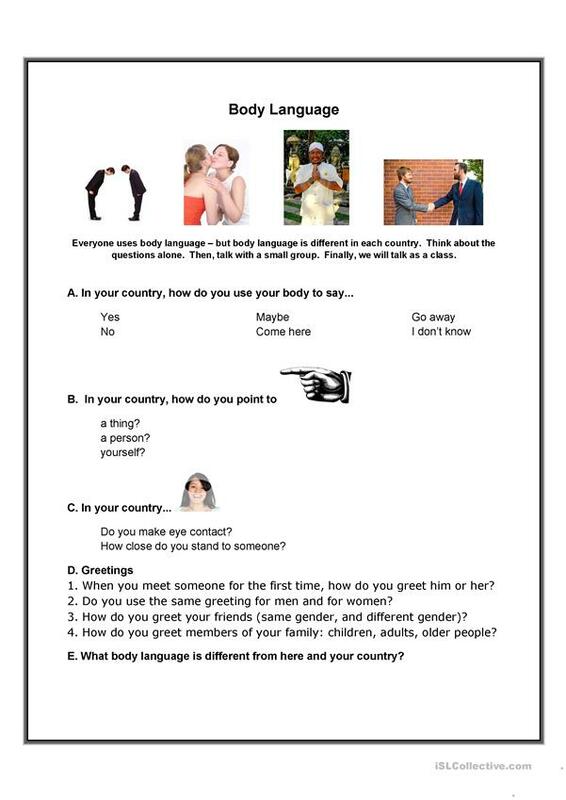 In small groups, students from different countries talk about how they use body language. The above downloadable handout was created for adults at Elementary (A1) and Pre-intermediate (A2) level. It was designed for working on your groups' Listening, Speaking and Reading skills. It is focused on the vocabulary topic of Body. ashtreemaiden is from/lives in United States and has been a member of iSLCollective since 2012-03-25 21:08:45. ashtreemaiden last logged in on 2012-03-27 19:31:47, and has shared 1 resources on iSLCollective so far.